The Monon (officially the Chicago, Indianapolis & Louisville until 1956) was a special favorite of railfans in the mid-twentieth century, as much as anything because of its remarkable resurrection from near-death by the legendary John Barriger III. Eventually it succumbed to the same ills as most mid-sized railroads and in 1971 was absorbed into the Louisville & Nashville. 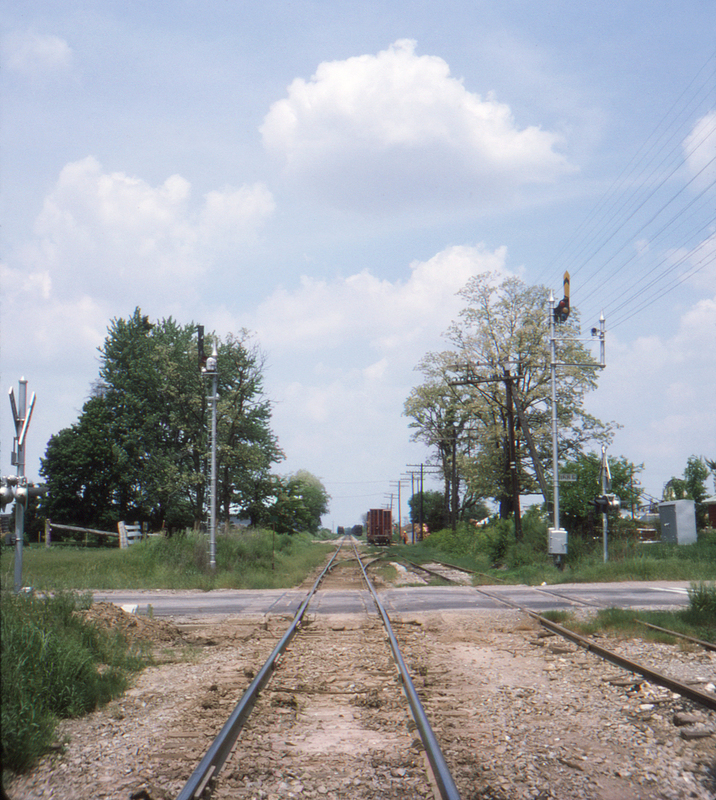 It retained a flavor all its own for a long time after, as illustrated by this grade crossing of Indiana State Road 36 in Bainbridge, Indiana, complete with semaphores. Note the "doll's arm" on the right hand signal bracket; it's impossible to tell from this photograph but these usually held a blue bulb to indicate to train crews that the main signal arm applied to the second track from the right. The Monon's route map formed a lopsided "X" with one route running from Indianapolis to Chicago, and the other from Louisville, Kentucky to Michigan City, Indiana on Lake Michigan, with the routes crossing at Monon, Indiana. Bainbridge was located on the Louisville to Monon part of the road.